uuid : f8114b6b-7618-4917-ae8c-522e047f8d1b templates_id: 119466 templates_uuid: "5b93f61d-4ac3-42cd-8c9f-1d52e0a302cf" title: "Power of Attorney (POA) - Free General Power of Attorney Form " display_name: "General power of attorney (POA)" meta_keywords: "POA, Ordinary power of attorney and Power of attorney" description: "
Make sure someone has the authority to handle your legal affairs with this power of attorney (also known as a POA) when you are out of the country or in hospital. This general power of attorney form allows you to give legal permission to someone else to make decisions and sign documents on your behalf. It is only for use when you still have mental capacity but are unavailable to act in person for some other reason. A general power of attorney (GPA) is a document that gives the attorney the power to deal with your affairs and to act on your behalf and in your name. It is governed by section 10 of the Power of Attorney Act 1971. Do I need a general power of attorney? You need a general power of attorney if you want to appoint someone to handle your documents or financial affairs in the event that you are absent or away from home or in any other specific situation when you need someone to act on your behalf. This could include executing documents when you are away or when you want to entrust a family member to manage your business whilst you are on holidays. The person giving the power is called the donor and the person to whom the power is given is the donee. Who can act as your attorney? to act as your attorney. The individual needs to have mental capacity and not be discharged or interim bankrupt. How many persons must witness the power of attorney? The power of attorney must be witnessed in general by one witness. However, in some circumstances, such as when you buy, sell or otherwise deal in Government securities or the power is used for matters outside the UK, you will need at least two witnesses. How long does the general power of attorney last? With this power of attorney you can set an end date if you wish, or it can be revoked using a revocation deed. How can a general power of attorney be terminated/revoked? A GPA can be revoked by a revocation letter. It will also be automatically revoked by the mental incapacity of the donor, i.e. who granted the GPA in a first place.
" created_timestamp: "2018-10-08 04:36:09.0" modified_timestamp: "2018-10-08 04:36:09.0" active: true created_by: 236 modified_by: 236 dcm_id: 167 url_slug: "General-power-of-attorney" meta_description: "Create a POA with simple guidance from Rocket Lawyer. This general power of attorney form gives power to a person to act on your behalf and protect your interests when you are ill or away. Grant powers of attorney in the UK with this form. " time_to_complete: "10 minutes" role1: "Donor" role2: "Attorney"
More than just a General power of attorney (POA) template, our step-by-step interview and guidance makes it easy to create your document. Easily create online, download, print and sign your free General power of attorney (POA) in minutes. 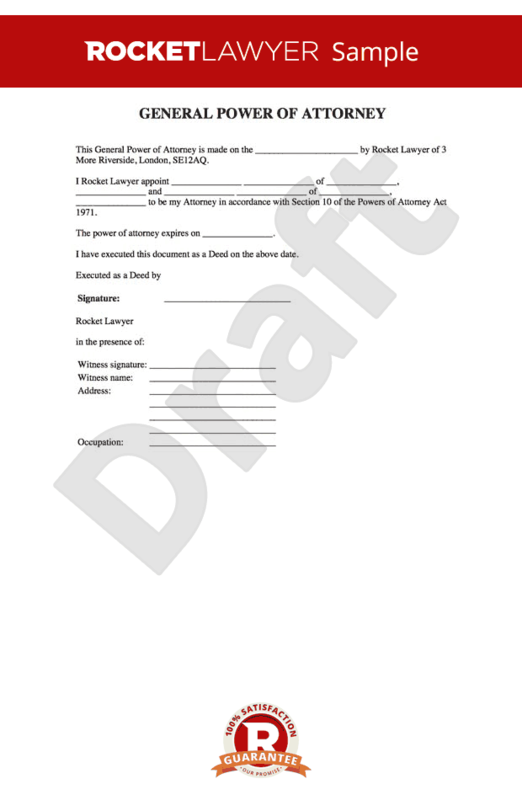 This document is also sometimes called: POA, Ordinary power of attorney and Power of attorney.